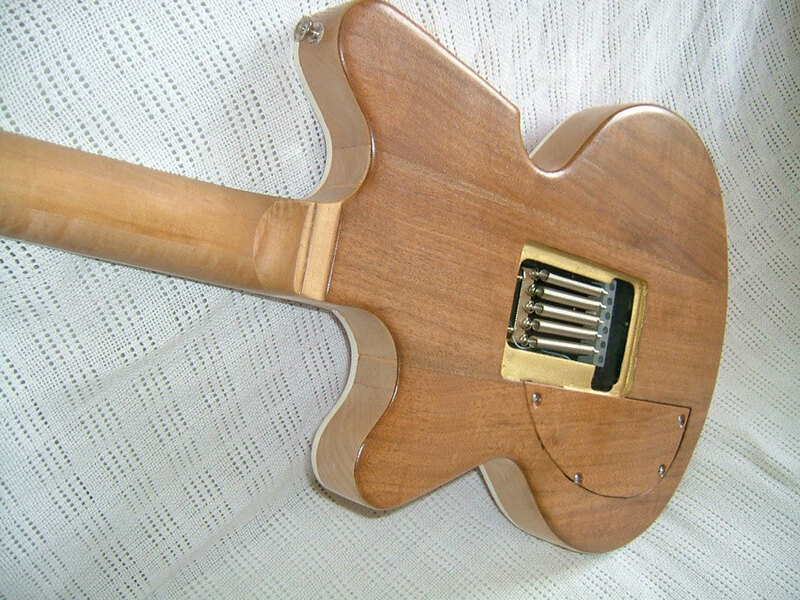 my FENDER KATANA PROJECT (modifying or horrifying?) and my SQUIER KATANA - guitarfritzs Jimdo-Page! Why would anyone restore this japanese metal axe and turn it into...? The foto above doesn`t show my Katana. Mine, that I found in a pawn shop in San Francisco and bought for 125 dollars, was totally ruined. 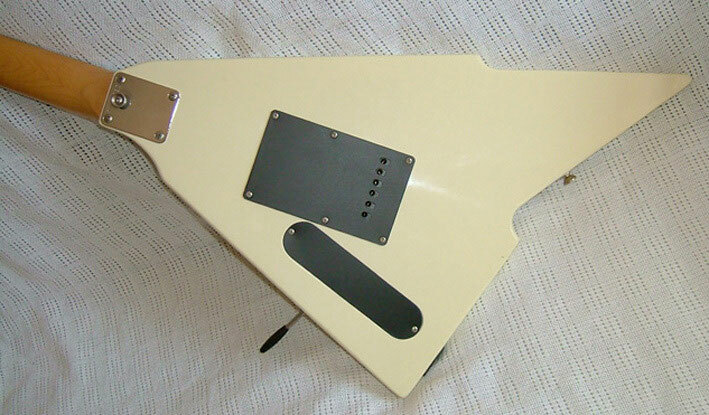 The electronics still worked and the neck was okay. But the bridge`s fine tuners were gone and the body had been treated with a saw, a screwdriver and a hammer. The colour had chipped off in many spots, the pointy horn had been chopped off completely and was missing and the body was studded with real deep dings and dongs and scratches. A lot of violence, hatred and strenght had been used here to destroy purposely. Some kind of death metal procedure, I guess, or a voodoo ritual. The original locking nut is missing here. Katana means "sword" in Japanese. I added some maple and a flame maple top, a binding and Sperzels. The small plate that covers the truss rod nut was hard to do. It took seven attempts to get it right. What was left of the original basswood body was sawn into a rectangular shape. then I attached a "wing" of maple to both sides, big ebnough for this new body shape that I had designed. Then I added a flame maple top and the binding and a layer of walnut wood on the back after the body had been chambered a bit to make it lighter. My father in law made six new fine tuners for that Fender Katana Vibrato and a new whammy stick. 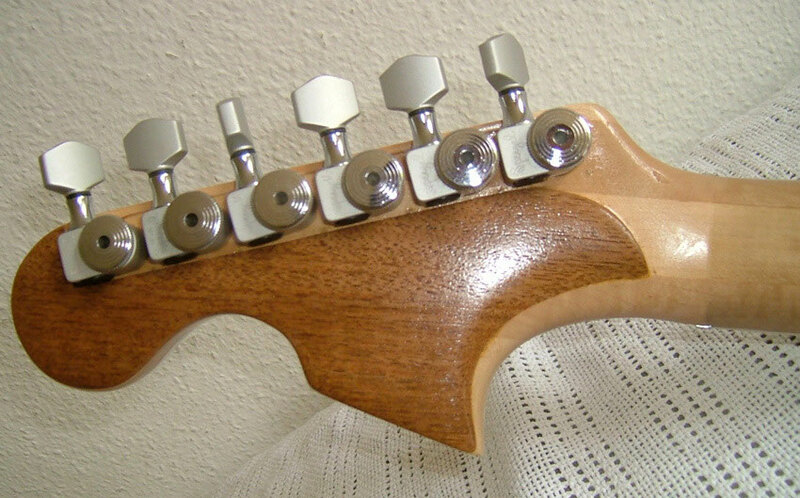 Note the position and angle of the five-way-selector. I feel that it works better this way around. I can control it`s movements a bit more easily than on a Strat. 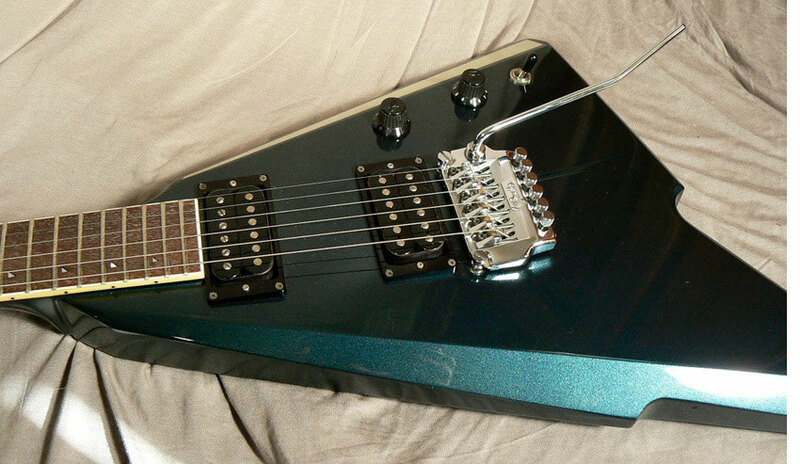 I still use the original pickups but I don`t really like them. They are muddy and lifeless, not even super heavey. I use them linked in parallel and in series and in series out of phase and individually. 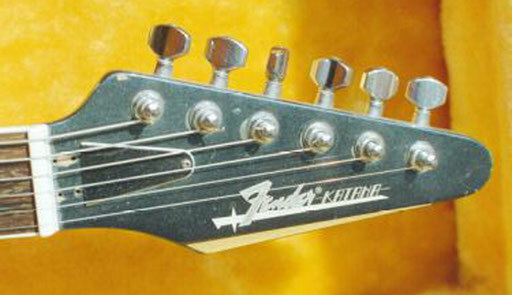 I also use the original Fender TBX wiring and an additional treble cut pot. the walnut hides the joint where I glued on some more maple to the original headstock. 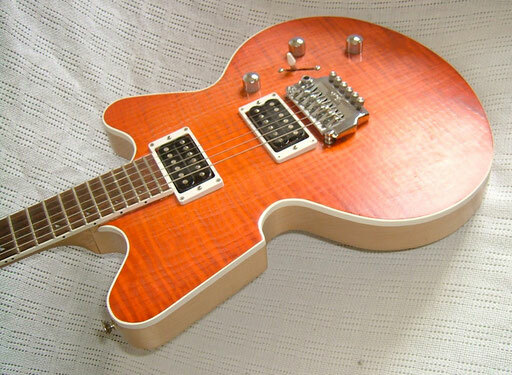 Note the three piece maple neck. Unusual for Fender but good quality. 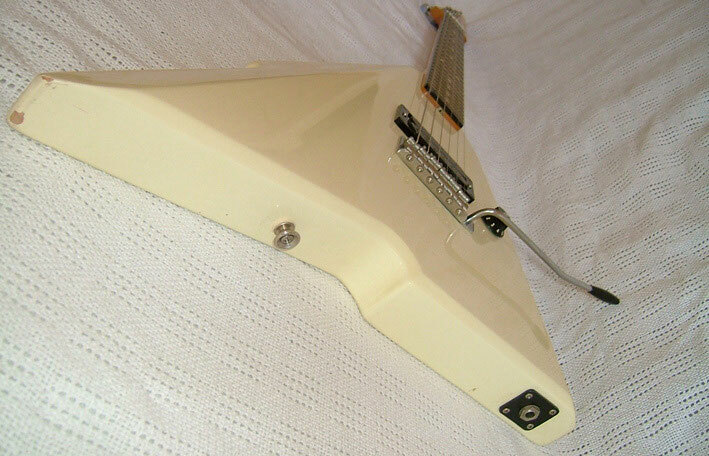 A set neck Fender is a rare beast. In 1985 and 86 when Feder Japan built this thing, the US Fender production was at it`s lowest point, quality-wise, financially and output-wise. You can see that I use 5 springs for the vibrato and that I screwed it down to sit on the body instead of using it floating. Can be used for downbends only but offers improved vibration transfer. Below you can see how difficult it was to do the binding an the fine sanding at this set neck joint since I didn`t dare to take the neck off. Again a nice original Katana - not mine. I wouldn`t have "restored" mine in that radical manner if it had been in such a good condition like the one here on this photo. 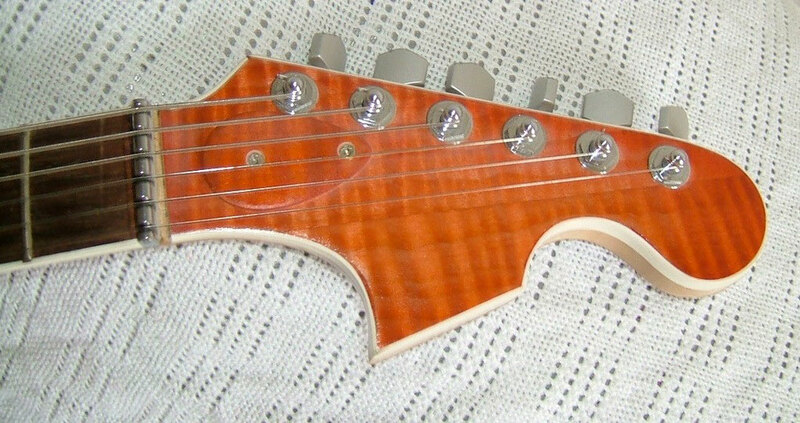 Note the nice inlay that is totally unique for Fender and also the bevelling of the body top. This is my other Katana. From Squier and not modded. 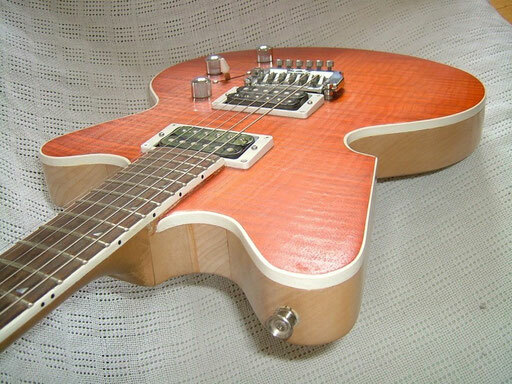 It had a badly cut nut and went out of tune all the time. 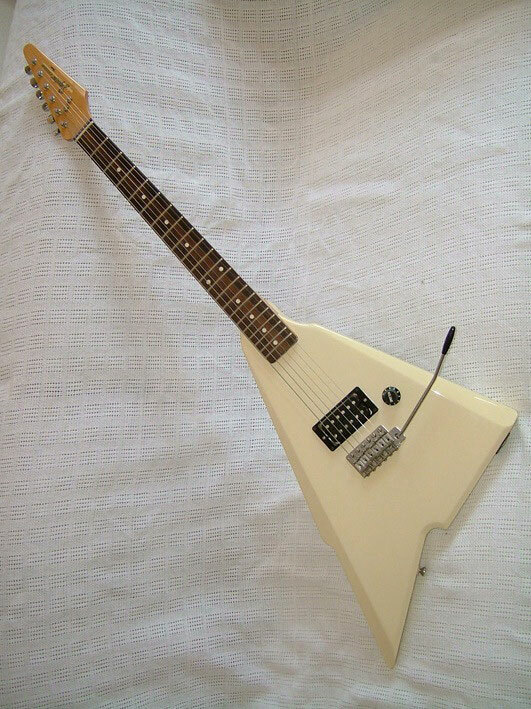 That`s why Alfie and his guys from the "Major 7" guitar shop couldn`t sell it. So I got it cheap. Has a nice, narrow spaced vibrato, lousy string trees that make tuning stability even worse than the nut, cheap tuning keys and electronics but a very, very nice neck. Is not in use and waiting to be modded, of course. a straight headstock here on the Squier while the more expensive Fender Katana has an angeled headstock which is another unusual feature for a Fender. Click on the picture to read that this one was really made in Japan!